Nando is a considered salsa dancer from Bogota, Colombia, with more than ten years of experience from performing and teaching salsa. Among other accomplishments he has qualified to the Puerto Rico Salsa Congress and he is a two time finalist of the World Salsa Championship in Cali, Colombia. In 2011 he moved to Stockholm, Sweden to spread his knowledge, discipline and foremost his passion for salsa music and Latin dance, especially the Colombian style salsa! 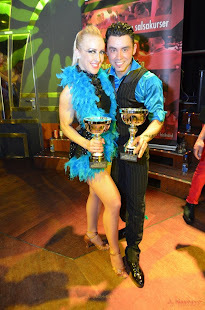 Susie has been seen on dance floors all over Europe for the last several years and she is a well known salsa teacher in Stockholm, Sweden. Her style is mostly characterized by her playfulness and interpretation of the music. In her classes she likes to focus on expression, musicality and body movement. She also loves to share the passion she has for the Latin music. On stage, Nando and Susie create an exciting mix of speed and power of the Colombian style salsa influenced by both jazz and street dance.